The best way to visual inspections into a habit is to schedule specific times to perform them. Consider documenting how frequently you plan to inspect your insulation in a mechanical insulation maintenance plan, then be sure to actually follow through with your plan. With this information, you can begin to determine an estimate of the energy wasted by ignoring the problems, the cost of wasted energy, and the excess of carbon dioxide generated from emissions. Many people do not understand or appreciate the effects of one small hole in a mechanical insulation system. Educating personnel as to the real cost of damaging a mechanical insulation system yields long-term dividends in the form of saving money on repairs and replacements. Make it clear to staff that insulation maintenance is something to be taken seriously. One of the best ways to save your mechanical insulation system is to have it regularly inspected and repaired by an insulation contractor. If you performed an insulation survey and discovered that your system has missing or damaged sections, consult an insulation contractor to determine the best course of action. Neglecting to repair insulation will result in a host of negative consequences, including increased energy costs and emissions, decreased personnel safety, and Corrosion Under Insulation, to name a few. 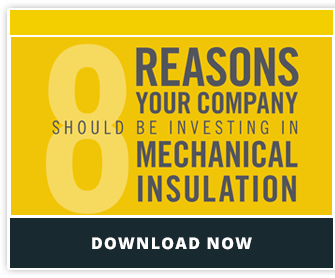 Get in the habit of paying more attention to your mechanical insulation system. The more care that is taken, the less money will need to be spent on repairs and replacements throughout the system’s lifecycle.